To avoid confusion, we’ll use the medical term atopic dermatitis. Children often get atopic dermatitis (AD) during their first year of life. If a child gets AD during this time, dry and scaly patches appear on the skin. These patches often appear on the scalp, forehead, and face. These patches are very common on the cheeks. No matter where it appears, AD is often very itchy. Infants may rub their skin against bedding or carpeting to relieve the itch. In children of all ages, the itch can be so intense that a child cannot sleep. Scratching can lead to a skin infection. Because atopic dermatitis can be long lasting, it is important to learn how to take care of the skin. Treatment and good skin care can alleviate much of the discomfort. Atopic dermatitis (AD) looks different in infants, children, and adults. The following gives you the signs (what you see) and symptoms (what you feel) for each age group. makes the skin dry, scaly, and itchy. forms on the scalp and face, especially on the cheeks (can appear on other areas of the body). can bubble up, then ooze and weep fluid. causes itching that may come and go. Rubbing against bedding, carpeting, and other things in order to scratch the itch. Skin infections, common due to rubbing and scratching. Parents often worry that their babies are getting AD in the diaper area. A babies rarely gets AD in his or her diaper area. The skin stays too moist for AD. Atopic dermatitis: This 6-year-old boy has atopic dermatitis in the creases of his elbows and on his feet — common places for AD to appear in children. A rash that often begins in the creases of the elbows or knees. Other common places for the rash to appear are the neck, wrists, ankles, and/or crease between the buttocks and legs. Itchy, scaly patches where the rash appeared. Get bumpy, looking like permanent goose bumps. Lighten (or darken) where AD appears. Thicken, turning leathery to protect itself from constant scratching. Develop knots (only on the thickened skin). Itch all the time (only on the thickened skin). Atopic dermatitis: This 7-year-old girl says the thickened skin on the back of her knees is always dry and always itches. The thickened skin can itch even when the AD is not flaring. When talking about the thickened skin, your dermatologist may use the word lichenification. This word means thickened skin. 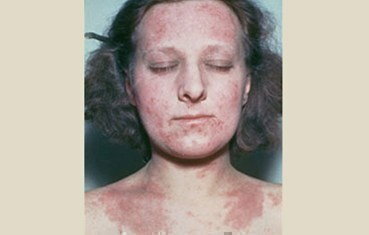 Atopic dermatitis: Adults who have AD often have darker patches and scaly skin, as does this 30-year-old woman. Appears in the creases of the elbows or knees and nape of neck. Covers much of the body. Can be especially noticeable on the neck and face. Can be especially bad around the eyes. Causes scaly skin — more scaly than in infants and children. If a person has had AD for years, patches of skin may be thick and darker than the rest of the skin (or lighter). Thickened skin can itch all the time. 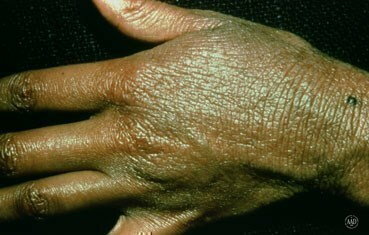 Atopic dermatitis: Years of scratching caused permanently thickened skin on this woman’s hand and wrist. This skin always itches. Skin that is easily irritated. Eye problems (eczema on eyelids, cataracts). Around the world, between 10% and 20% of children have AD. About 1% to 3% of adults have AD. People of all skin colors get AD. Most people (90%) get AD before their 5th birthday. AD rarely starts when a person is an adult. Family members have AD, asthma, or hay fever: Does the child’s mother or father have AD? Does a parent have asthma or hay fever? A family history of these diseases remains the strongest risk factor. If one or both parents have AD or an allergic condition, the child is much more likely to get AD. Some children get all 3 diseases. Asthma and hay fever usually appear before the age of 30. People often have asthma and hay fever for life. Where child lives: Living in a developed country, city (especially one with higher levels of pollution), or a cold climate seems to increase the risk. For example, Jamaican children living in London are twice as likely to develop AD as those who live in Jamaica. Gender: Females are slightly more likely than males to get AD. Mother’s age when child born: When the mother gives birth to the child later in her childbearing years, a child is more likely to get AD. Social class: AD seems more common in higher social classes. Is not contagious: There is no need to worry about catching it or giving it to someone. Runs in families: People who get AD usually have family members who have AD, asthma, or hay fever. This means that genes play a role in causing AD. Children are more likely to develop AD if one or both parents have AD, asthma, or hay fever. About half (50%) of the people with severe AD (covers a large area of the body or is very troublesome) will get asthma and about two-thirds (66%) will get hay fever. Can certain foods cause atopic dermatitis? Foods do not cause AD. But some studies suggest that food allergies can make AD worse. Children who have AD often have food allergies to these foods — milk and foods that contain milk (e.g., yogurt and cheese), nuts, and shellfish. Before you stop feeding your child any foods, talk about this with your child’s dermatologist. Children need certain foods to grow and develop normally. Researchers continue to study what causes this complex disease. They believe that many things interact to cause AD. These things include our genes, where we live, and the way our immune system works. How do dermatologists diagnose atopic dermatitis? To diagnose atopic dermatitis (AD), a dermatologist begins by looking at the child’s skin. The dermatologist will look for a rash. The dermatologist also will ask questions. It is important for the dermatologist to know whether the child has itchy skin. The dermatologist also needs to know whether blood relatives have had AD, asthma, or hay fever. Sometimes a dermatologist will perform a patch test. This medical test is used to find allergies. It involves placing tiny amounts of allergens (substances that cause allergies for some people) on the child’s skin. The dermatologist will check the skin for reactions. Checks are often done after a few hours, 24 hours, and 72 hours. Studies suggest that some allergens can make AD worse. How do dermatologists treat atopic dermatitis? Prevent the AD from getting worse. Calm the skin, relieving pain and itch. Stop the skin from thickening. Thickened skin often itches all the time — even when the AD is not flaring. A treatment plan often includes medicine, skin care, and lifestyle changes. Skin care and lifestyle changes can help prevent flare-ups. Many patients receive tips for coping. Doing all of this may seem bothersome, but sticking to the plan can make a big difference. Reduce skin inflammation (redness and swelling). Loosen and remove scaly lesions. Reduce new lesions from forming. Studies have found that when AD develops in an infant or young child, the child tends to get better with time. For some children, the condition completely disappears by age 2. About half (50%) of the children who get AD will have it as an adult. The good news is that the AD often becomes milder with age. There is no way to know whether the AD will go away or be a lifelong disease. This makes treatment very important. Treatment can stop the AD from getting worse. Treatment also helps to relieve the discomfort. Most children’s eczema does not have a clear cause, such as an allergy, but most eczema will improve with good skin care. These tips from dermatologists can reduce the severity and frequency of your child's flare-ups. Buy clothes without tags because tags can rub against the skin, causing irritation. Good skin care is a key part of gaining control of your child’s eczema. If skin care has not been a regular part of your child’s treatment, you should make an appointment for your child to see a dermatologist. Are the shots that treat hay fever and other allergies useful? Allergy shots have not proven helpful for AD. Shots may even make AD worse. There is an exception. If the shots treat a patient's lung allergies, the skin may get better. Before trying allergy shots, be sure to talk with a dermatologist. Use regular strength – 6 percent – bleach for the bath. Do not use concentrated bleach. Use a measuring cup or measuring spoon to add the bleach to the bath. Adding too much bleach to the bath can irritate your children’s skin. Adding too little bleach may not help. Measure the amount of bleach before adding it to the bath water. For a full bathtub of water, use a half cup of bleach. For a half-full tub of water, add a quarter cup of bleach. For a baby or toddler bathtub, add one teaspoon of bleach per gallon of water. Never apply bleach directly to your child’s eczema. While the tub is filling, pour the bleach into the water. Be sure to wait until the bath is fully drawn and bleach is poured before your child enters the tub. Talk with your dermatologist about how long your child should soak in the tub. Most dermatologists recommend a five- to 10-minute soak. Pat your child’s skin dry after the bath. If your child uses eczema medication, apply it immediately after the bath. Then moisturize your child’s skin. Talk with a board-certified dermatologist before beginning bleach bath therapy with your child. If you have questions or concerns about caring for your child’s eczema, you should make an appointment to see a dermatologist.